A SQL cursor provides access to data one row at a time there by giving you direct row-by-row control over the result set. 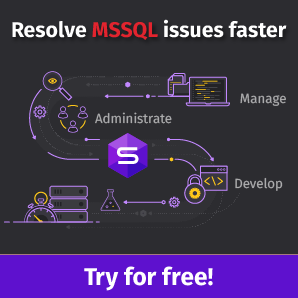 According to the Microsoft documentation, Microsoft SQL Server statements produce a complete result set, but there are times when it is best to process it one row at a time – which can be done by opening a cursor on the result set. Please keep in mind that, according to Vaidehi Pandere, cursors are pointers that occupy your system memory – which would otherwise be reserved for other important processes. That’s why traversing a large result set by using cursors is usually not the best idea – unless there’s a legitimate reason for doing that. For more detailed information on this, feel free to refer to my article How to use SQL Cursors for Special Purposes. First, we will look at an example of how a SQL cursor can be used to rename database objects one by one. In order to create a SQL cursor we need, let’s setup a sample database so that we can run our scripts against it. Refreshing the tables’ names in the SSMS object explorer clearly shows that we have successfully changed them as specified. We also need to create a script which uses a SQL cursor to revert the names of the tables we have just changed back to the initial ones – we’ll do this by removing ‘_Backup’ from their names. These were the examples of some scenarios in which it is difficult to avoid using SQL cursors due to the nature of the requirement. However, it is still possible to find an alternative approach. There are two most common alternatives for SQL cursors, so let’s look at each one of them in detail. One of these alternatives are table variables. Table variables, just like tables, can store multiple results – but with some limitation. According to the Microsoft documentation, a table variable is a special data type used to store a result set for processing at a later time. However, keep in mind that table variables are best used with small data sets. Table variables can be very efficient for small-scale queries since they work like local variables and are cleaned up automatically upon getting out of scope. 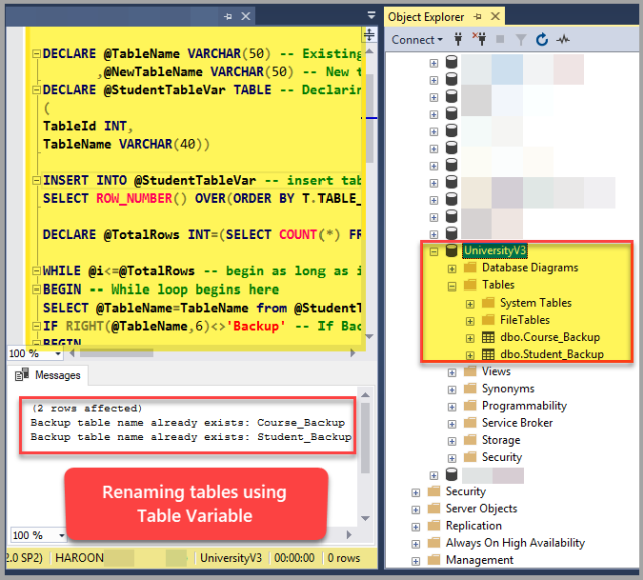 We can also use temporary tables instead of SQL cursors to iterate the result set one row at a time. 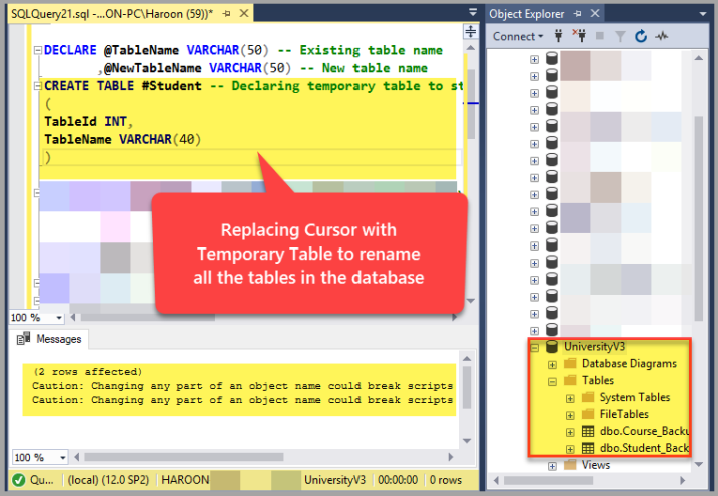 Temporary tables have been in use for a long time and provide an excellent way to replace cursors for large data sets. Just like table variables, temporary tables can hold the result set so that we can perform the necessary operations by processing it with an iterating algorithm such as a ‘while’ loop. 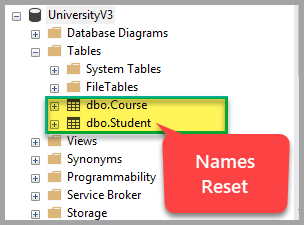 We need to reset the tables’ names to their initial form by deleting ‘_Backup‘ from the end of their names, so please rerun the reset script we have already written and used above so that we can apply another method of renaming tables.